A lake house is a great place to unwind, spend time with family and friends and entertain. You want your home decor to reflect all of this as well as accenting your home location. Using colors, textures, and accent pieces, you can achieve all of this with flair. While you aren't limited to purely lake-related color schemes, if you want to accentuate this aspect of your home, then go with one of these color schemes. Blues: Use a varying range of values from light to dark blue to capture the essence of lake and sky. Greens: Vegetation is profuse around bodies of water. This can be trees, wildflowers, and shrubbery. The hue values range from new green (very light colored greens) to evergreens (pine and cedar). Browns: The earth color makes great accents for a lake home beginning with light brown and growing into dark chocolate brown. Autumn colors: If your lake house is in a region that enjoys fall foliage, take a few colors from an autumn palette, such as russets, yellows, oranges, golds and reds. Select a main color from the above choices and add two secondary colors. Keep these colors in mind when selecting paint, draperies, furniture, upholstery, wall art, and other furnishings. The colors will work whether you choose a traditional or contemporary home décor scheme for your lake house or go for something different with a rustic, country, mountain cabin, or modern design. 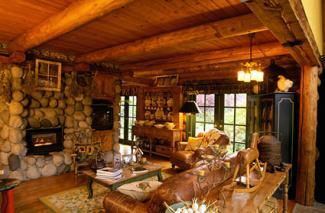 Achieve a rustic décor by using various elements, such as flooring, lighting, and upholstery. When it comes to flooring, go with a wide plank flooring in a dark or medium stain for all rooms. Stain or paint in distressed style for a truly rustic effect. A slate or other stone floor is a great choice for an entrance area, hall, bathrooms and even the kitchen. Hooked or braided area rugs are excellent choices for this design style decor for the den, dining room and bedrooms. Choose wood furniture, especially pieces with distressed finishes, such as sideboard, console table, end table for a den, table and chairs for the dining room and wood pieces to complete bedroom suites. Wood and ironwork combinations will add to the rustic look. Select upholstery fabrics, such as leather, tapestries, chenille, and other tactile-friendly ones. Include other pieces to round out the rustic scheme. Accent objects: Create a wall or corner vignette with old bottles, tools, tin signs and other antique collectibles in the kitchen or den. A weathered boat figurine, a pair of cane poles mounted on the porch wall sets the scene. You might select a fish or boat motif or use a combination of several. Lighting: Mission style lighting works well with this design. However, you may prefer a more rustic look with lantern or hurricane style lamps, pendants, chandeliers, and wall sconces. Wall art: Add wall art, such as a metal sculpture over the fireplace mantel, rough plank signage in a half bath, painting and photos in rough wood or distressed frames on a dough box table in the den. Window treatment: Wood slat or panel shutters can be stained or painted. You may prefer wood plantation shutters for windows, especially in the bedrooms. Add draperies or curtains in either a solid, stripe or plaid pattern. Wood elements: Add rough-hewn exposed beams, rough-finish paneling in the den or for wainscotting, distressed wood doors and reclaimed barn doors for effective design. 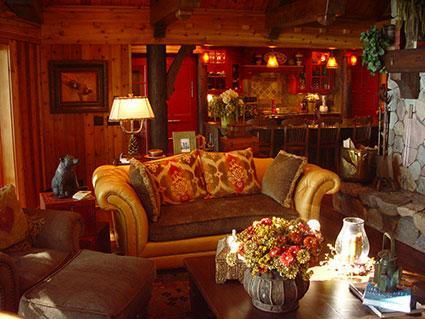 Use a country style for your lake house to create a comfy restive décor. Wood flooring is the ideal country style in a wide plank, such as a heart pine floor or rough-hewed oak. Stain the floor dark featuring distressed markings, or use reclaimed barn or other boards. A whitewash effect in any color you may like can also create a primitive or country look. Go with an oval braided rug in the den, dining room, and bedrooms. Smaller ones can be used at the entrance, kitchen, and laundry room. Choose wood furniture for trestle dining table and ladder-back chairs or long wood benches. Soften these with gingham cushions in blue, green, red or brown. Painted furniture, glass door bookcases, and punched tin pie safes are some great finds. Go wicker for deck or porch. Bleached cotton, blue, green or brown ticking or gingham, duck cloth, and quilted patterns. Quilted patterns fit in bedrooms and family rooms nicely, while gingham is perfect for that country kitchen and dining room. Don't forget to add some smaller accents throughout the home. Accent objects: Opt for several hand-blown blue and green bottles or vases to place along the kitchen window sill. Add primitive hand-carved figurines on bookshelves, mantels, or side tables for a great display. Faux daisies in old tin canisters become table decorations and old fishing signs make great conversation pieces for a guest bath or entrance/mudd room. Lighting: Old-fashioned wheel or barrel lighting fixtures, candle chandeliers with individual lamp shades, and industrial dome-shaped pendant lights are a great start in lighting choices. Add the big pieces to the foyer and family room or den, while smaller pendant lights work nicely in kitchens. Wall art: Primitive decorations, like plaque of wood carvings of various subjects, including fishing and boating look great over a mantel, den wall, front entrance, or kitchen. Use a floral relief carving on the wall above the bed or in a bathroom on the wall behind the tub. Window treatment: Wood shutters or blinds can be combined with simple draperies made from ticking, gingham, or duck cloth. If your lake house is nestled in the mountains, take advantage of this theme with various décor choices. Once more, wood flooring is a good choice or a natural stone tile for an authentic look. Opt for a dark or medium stained floor. Depending on the region, you may wish to use a pine or oak flooring. Many people love the look of a bearskin rug. 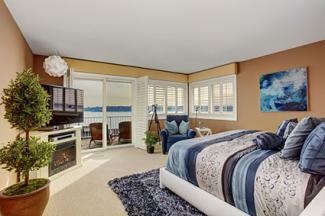 Select a faux bearskin rug and place in front of a den or bedroom fireplace. There are many mountain motif area rug designs you can use throughout your lake house. You may decide to go with a plaid rug in a green and blue or red and brown and add them to the kitchen, foyer, and bedroom. 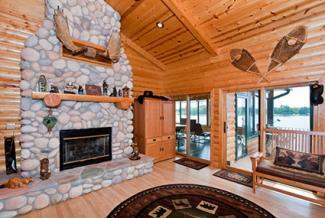 Lodge, log cabin, and Alpine furniture styles are popular choices for a mountain cabin lake house. Mission, Shaker, and even Arts and Craft furniture styles go well with this type of décor. Pick one style and carry it throughout the various rooms in your home. Choose fabrics that relate cozy and comfortable, such as chenille and suede. Leather is a mainstay for cabin furniture and perfect for the den and living room. Stay within your color scheme if you want to add accent patterns. Patterns choices include animal, geometrical, striped, or solid colors. Include patterns on bedding in bedrooms and towels and tablecloths in the kitchen. Include more decorative pieces throughout your home to really bring out the moutain style. Accent objects: Choose decorative accents using pine, bear, trout, deer, and other mountain motifs. Place at least one in every room and as many as three or five. Vary the size and type of object you use, such as a carved bear statue on the hearth or a pair of duck decoys on a shelf. Lighting: Mission, Arts and Craft, lodge lighting are all good choices. Many of these have either mica or stained glass shades that can add to your overall design. Some shades also have wrought iron cutouts of bears, deer, trout, and other mountain symbols. Wall art: The subject matter of wall art can include trout, fly-fishing, bears, deer, pinecones, pine needles, rowboat, sailboat and other related motifs. The bathroom and front entrace are great space, as are over the sofa in the den and headboard in the bedroom. Window treatment: Select a style that goes with your overall décor in a fabric, such as a plaid, solid color in a textured fabric like linen, or a pattern. Not all lake houses fit into a typical design category. Some are even modern designs. Design your lake house to reflect this in your choices of furnishings. There are many choices of flooring for a modern home that go beyond wood or stone, such as cork, pure vinyl or even marble. Go as modern as you desire, but keep the flooring texture or design similar throughout the home to create a cohesive look. A stylized modern design can translate the wake of boat moving through the lake or a sunset glistening over the water. Think abstract design when searching for the perfect rug. Modern furniture can be made from wood, plastic, iron, leather ,and just about any material imaginable. White leather sectionals or blue denim upholstery are modern statements for lake house décor scheme. Chrome and glass make modern designs sparkle like the surface of a lake. Modern fabrics are often textured and reveal geometric shapes and patterns. Solid colors can be vibrant blues and greens to carry the lake theme. Be sure that the fabric you select for your furniture blend with the overall modern design of the furniture piece. Pick out some pieces that supplement the modern aesthetic you've chosen for the lake house. Accent objects: Select one or more accent motifs and repeat them throughout your home. Use various subject matters, such as modern sculpture of a deer, hand-blown glass figurine of a fisherman, and other modern themed decorative objects. Choose a mix of materials, finishes, and colors to create greater interest and depth in your design. Lighting: Go with blue glass pendant lighting over a kitchen bar with a white quartz countertop. Freestyle chandeliers or wall scones make a modern lake home vibrant with movement. Use in a foyer, bathroom, hallway, and bedrooms. Wall art: Modern interpretations of a lake, mountain, birds, animals can be displayed through original works of art, such as paintings, photos, plaques and wall sculptures/reliefs. Use these over a mantel, the entrance, porch, den, kitchen, and bedrooms. Window treatment: Many modern homes use the windows as a design element and allow the window to remain uncovered. You may still need something to shield intense morning or afternoon light. Electric blinds that can disappear when not in use. Roll-up bamboo shades can be used on a porch and floor to ceiling draperies used on tall bedroom windows. 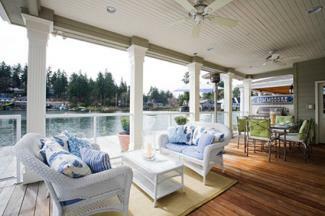 You can make your lake house unique by keeping your theme in mind and carefully selecting each furnishing. Keep color, texture and motif as your guidelines and your finished design will reflect the elements specific to a lakeside environment.